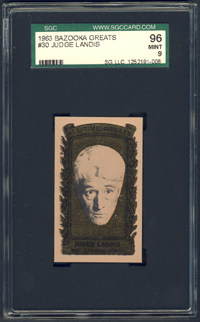 Baseball's first Commissioner, Landis left his job as federal judge in 1920 to take complete control of the major leagues. In cleaning up the Black Sox scandal, he restored the public's confidence in the integrity of baseball. His rule was law, and nobody dared challenge his authority. 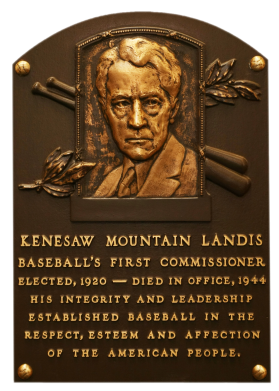 A champion of player rights, he unsuccessfully tried to halt the farm system. Comments: In November, 2004 an eBay win rewarded me with a 1960 Fleer PSA 7. In August, 2007 I decided to replace the item with a new type card and picked up a raw EX/MT 1963 ATG card. In August, 2007 I upgraded to a PSA 7 with a purchase via the Net54 B/S/T pages from Pete Zouras. In February, 2008 a PSA 8 popped up on eBay and my crazy snipe won me the card. In March, 2011 I remember going through my eBay searches and I was shocked when I saw this SGC 96 example come up on the screen. I monitored the bidding until the end and remember submitting my last second snipe to steal the card. I was pretty excited with the win from seller Britt Savage (bsatttu). This card has always cracked me up. Description: Consisting of 41 cards, the Bazooka All-Time Greats set was issued as inserts (5 per box) in boxes of Bazooka bubble gum. A black-and-white portrait photo of the player is placed inside a gold plaque within a white border. 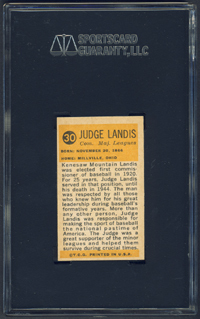 Card backs contain a brief biography of the player. The numbered cards measure 1-9/16" X 2-1/2" size.